The Mt. 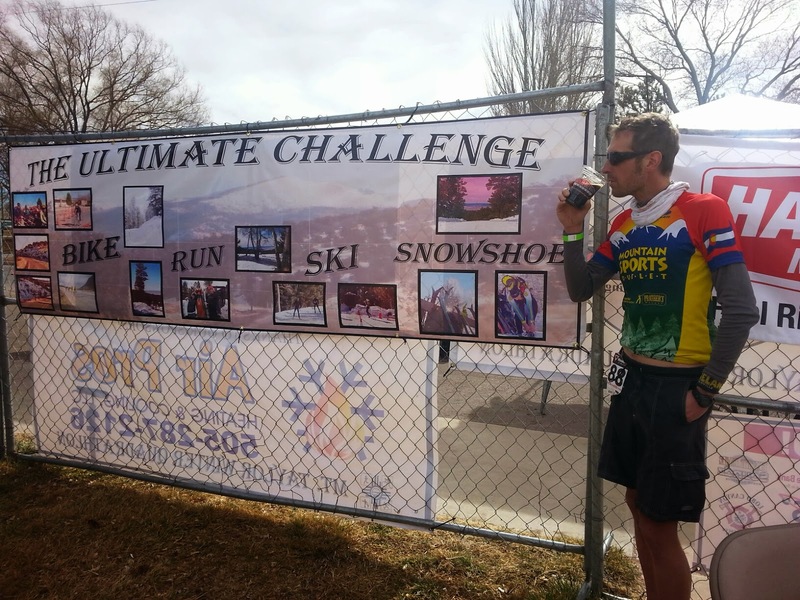 Taylor Winter Quadrathlon is in its 31st year, and is truly a one-of-a-kind event. Biking, running, skiing, and snowshoeing, in February -- all to the glorious summit of an extinct volcano. My friend Ben did this a couple years ago and had a great time, despite a bike crash and some whiteout conditions, and highly recommended it. New New Mexico residents Stephanie and Chris signed up for it, and convinced Alex and I to do the same. So we all had a date with the volcano. The course layout was very natural and unique: imagine a big, obvious mountain looming in the distance above town, and taking a natural human-powered path to the top. With the support of the race coordination and logistics -- hundreds of volunteers on the mountain -- merely signing up enables a fun adventure. As for racing, I'd never actually done a triathlon, so a multi-sport event had some intrigue and novelty to me. Skiing promised to be way more rewarding than swimming, but there were plenty of transition issues and challenges to deal with. As a novice, it was fun to line up with a big deal of uncertainty that I no longer get during running races. Looking at previous results, I thought some sort of goal between 4 (highly-unlikely)-5 hours was reasonable. As expected, that puts it in the realm of (roughly) a 50k easy-trail effort for many, albeit using a variety of muscles. I failed to break 5 hours but had fun in the process, so I'll tell you a bit about the course, the mistakes I made, and the fun I had. I love biking, I've done numerous group rides and tours and many more solo rides, but I've never raced before. I've always been intimidated and frustrated by the performance and equipment dependency of the sport, but also used it as a mental block for even attempting it. In running, you can't really buy much performance, but in bike racing, intermediate-level wheelsets cost more money than I've ever paid for a bike. However, courtesy of my good friend Neil, I had quite the steed at my disposal: a gorgeous titanium Moots Vamoots decked out in Campy, which he has so graciously let me borrow and ride, and over time I've gotten the bike dialed into my fit and comfort. "I'm not worthy!" What I wouldn't give to be able to take a long rambling ride with him now, and thoughts of many of our previous rides, runs, and general shenanigans certainly passed through my ride during hours out on the course. We lined up, with some aero helmets and dished wheels near the front. I was shivering and in the minority while wearing shorts and no jacket, but gambled that climbing on the bike would add sufficient warmth, and even hoped to wear the same clothes all day. Two minutes before the start of the race, I realized that my bike pump (such a noob, but in >50k miles of riding I've still never used CO2 on my own bike) had fallen out of my jersey pocket somehow. Whoops. Don't do that. I was at the mercy of the course. We started out through a few turns in the flat part of town, before heading more gradually up and out of town. Based on previous results, my rough idea was to hang onto the chase pack and try to break around an hour. Unlike many triathlons, there aren't any written rules about drafting, so we were bunched pretty close together. Despite some solid speed, we were bunched closely with a few sloppy lines up to 4 or even 5 across, with a few jerky and shaky wheels as people continued to jostle for position and pass a bit unnecessarily early. It was hard to know who to trust. It was unnerving but exhilarating at the same time. Finally, after about 5 miles or so, we stretched out a bit more and assembled into a legitimate peloton, with the leaders well within view but gaining slightly. Now I had a chance to chat a bit and get to know some of the fellow riders, and it was good to be a bit social while still working. I met the women's leader, so it seemed to be a good position to be in. It was still everyone for themselves, but as far as drafting I at least made sure to pull as much as I sucked. The steeper pitches, as we climbed higher, separated things a bit more. I was warm enough and some of the guys were commenting on the balmy temps as we headed up the exposed canyon. The miles clicked quickly and we were nearing the 13M mark. I felt that I had reserved enough to push the final bit (about another half mile) thinking that I would recuperate enough during the transition. A volunteer met me at the transition, where I took a drink and a gel, and fumbled with shoelaces and shoes (going with my lightweight, beat-up Peregrine trail shoes) while keeping my gloves on. I thought I moved pretty quickly on the transition, only to recognize 4 or 5 people who were about a minute behind me on the bike that were now a minute or more ahead of me on the run. After being out for only an hour, my quads had an unfamiliar, dull feeling of fatigue as I headed out on the run. It took a bit to clear out lactate but I was still able to gain a bit. I was arrogant in thinking that I would catch everyone who passed me on the transition, but luckily I was right about this. What I learned, though, was that running 20 or 30 seconds faster per mile is worthless if you blow it all on a slow transition. As it took me over 3 miles to catch up to one of the guys I recognized from the bike, I asked him, "Dude, did you even stop, or did you hop off the bike and keep running?" He laughed and said he guessed he had a bit of experience in it, then noting that he noticed my (mountain) bike shoes had laces. "Yeah, you don't want to deal with laces at all." Anyway, with a net uphill, I kept it conservative at around 8-min miles. But otherwise having no idea how much energy and effort to conserve for the rest of the day, I now realize why x-athlon is such a place-based (instead of time-based) sport, as it's sensible to monitor the people around you. I was doing better than expected, and seeing Nora at the ski transition, she told me I was in the Top 10. And the uphill ski is where it all went downhill. I stuck with my plan of staying in shorts, and this was still working out well, because it was as warm as expected. Now, numerous people had suggested that skins were "necessary" for the uphill ski. I debated this and could have easily gone with my tele skis and skins. That would have also necessitated heavier plastic boots. But I've taken my skinnier, waxless skis up longer and steeper stuff. Worst-case, I don't mind herring-boning up when necessary. Plus, it hadn't snowed for a week (and the previous week just barely snuck in a storm that gave decent coverage), and it had been in the 50s and 60s the previous few days, with plenty of sun. So I expected the snow to be wet and sticky. That sort of soft snow can be easy to climb, and in fact the worst part of dealing with snow like that is heavy clumping underneath skis. And I hate that. So before we left town, I glide-waxed my skis, including the fish scales. And that ended up being a terrible decision. Because of lack of snow, they cut a trail that weaved through the trees (where snow was deeper), doing a great job in giving a course that stayed on top of sufficient snow. The whole course was groomed by snowmobiles and cats just before the race, but at this elevation and with some shading in the trees, the snow really wasn't sticky at all. In fact, it was slippery and icy. Immediately, I found myself floundering around in the trees as I couldn't get any purchase, and then I routinely pulled off to the side so as not to block other racers. I fell a couple times and dropped my water bottle a few more, feeling like a total rookie. I recognized and got encouragement from a dozen or so passerby's, many of whom I had met earlier on the bike and run. To a (wo)man, they all had skins. I slipped onward and upward. I had visions and ideas about sacrificing bits of clothing to make ghetto kicker skins. (I still am thinking about this a bit). About halfway up, I decided to try something brilliantly mad: to put my skis through my snowshoes, fashioning some sort of ski crampon underneath my foot. I tried this in both directions and wasted a good 6 or 7 minutes, before realizing it wasn't working. Onward. I could have walked and carried my skis faster, but didn't know if that was against the rules, even though my snowshoe-crampon idea was arguably more questionable. In any case, it felt wrong: I made my poor decision and was going to stick with it. Finally, I saw the course veer around what would normally be the final summit push up "Heartbreak Hill," but lack of coverage (due to wind) meant we took an alternate, slightly longer course. Honestly, busting straight up an open hill would have been easier, as I could have side-stepped and herringboned, but instead I picked my way through occasional rocks and narrower trail, and finally got near the top, which took a full hour, well behind my expectations but somewhere in the average/middle of the day's climbing times. I never imagined I'd be grateful to ditch skis for snowshoes, but here I was: strapped into my wife's 21", feminine yellow shoes. Another gamble based on cheapness. I kept my soft ski boots on (another planned reason for going with the skinnier skis), as well as my poles. And my helmet, which got some laughs and good-natured comments (it's light, somewhat warm and I didn't see a reason to ditch it). This was the gear gamble I was most worried about -- but it worked out just fine. I should have been able to run faster, but focused on recovery from the brutal ski and just maintained position in a shuffling jog. The final push to the summit still had sufficient snow, and the clear day gave us great views to the valley below. Race or no race, this part of the course gave a true sense of vertical accomplishment. I made it to the summit turnaround, just a yard or two from the true summit, but I took a few extra steps and seconds to hit the summit and enjoy the view before bounding downward. I hit the summit at 3:09, whereas my rough swag at a 5-hour goal had me hoping for 3-up, 2 down (or faster). This ended up being unfortunately dead-on. The snow was packed enough that the snowshoes weren't necessary, unfortunately, but I shuffled down without tripping. My lackadaisical treatment of the bindings caught up to me as a shoe slipped off. I carried it briefly, able to run faster without them, but again didn't want to mess with the spirit of the race, so I put them back on. I forgot to tell you about the highlight of the race, besides the summit: a few dudes that set up a full bar just below the summit. I was happy to see these guys, a New Mexico mixture of white and Native men decked out in leather and turquoise. I think it was early in the race as the "serious" people hadn't been stopping, as most of the bottles weren't opened up yet, so I got first shot (or two) of blackberry brandy. Warmed and satisfied, I continued shuffling back to my skis. For most people, the ski down was even more infamous than the ski up. Again, the usual course had to be modified, this time from a sweeping, forest road, into a steeper, more direct route. People were warned/suggested to keep skins on for the descent. Again, no decision here. The steepness was manageable, but tight switchbacks and some off-camber, bouncy, rollercoaster terrain made things more difficult. Basically, you'd hit a switchback, turn, and make sure I could manage speed to the top of the next visible "hump," where I'd snowplow if necessary, with burning thighs, to bleed off speed. Basically, making sure there was always enough room to slow down. Others were doing the same, mostly more conservatively. In skinny skis, it was exhilarating, and I passed 4 people on the way down. I was passed twice by full AT gear -- this would have just been a narrow Blue run at a Western ski resort -- so it was another suggestion that I should have gone with beefier gear. But I "lost" less time than I thought on the way down. And the concentration required of "don't-tear-an-ACL-or-break-a-bone" made the time go by quickly, as I wasn't thinking at all about the upcoming run or bike. I was happy to see Alex at the bottom of the ski hill, and he accompanied me to the transition. He, and a sheriff, helped me untangle knots in my beat-up shoes. As I moved around and ditched gear, I had laughable muscle pulls and cramps from unusual locations. Eventually we got my shoes ready and I headed down the hill, where I shouted to Alex a few times to make sure I was going the right way -- despite having come up that way, earlier, I was paranoid about a wrong turn. Opening up the legs felt good after a bit of stiff jogging. My energy was up and I was motivated to catch up to the people that, irrationally, I felt shouldn't be ahead of me because of my uphill ski debacle. Of course, this makes no sense because we all had equal opportunities on our strengths and weaknesses, but it was good motivation. Sure enough, I rolled up on a half dozen or so folks, and put up several minutes as a gap. Without anyone really running as hard next to me, though, I put in just enough effort to gain time and didn't run as hard as I might have in a pure running race. Again, though, my wasteful transitions countered this effort a bit. Now I was back on the bike. The tires weren't flat, so that was good. I was right at 4:30. 30 minutes to ride 13.5 miles was a tall order, but I figured I'd see how long I could hold the pace. The top pitch had us spinning out of gears and hitting the mid-40's already. Unfortunately, a guy who I had passed solidly on the run blew past me without pedaling. He weighed a good two-stone more than me, and I (irrationally) again figured this wasn't fair (despite my previous "unfair" advantage of only having to carry a lightweight skeletal frame up the mountain in the morning), but there was nothing I could do until we pedaled some more. But he had gained a good 90-120 seconds on me in the gravity-assisted section. Again, my energy was still good, and on a couple bumps of hills, I pushed it, getting within 30-45 seconds, but couldn't close the gap. Oh, I forgot to mention the annoying headwind, which sucked off some of our speed and made the 5-hour goal insurmountable. I didn't really care about catching anyone so much as trying to get close and then draft/work together. I made occasional checks behind me but nobody was in sight, so as it turns out, the focus on keeping pace with the guy ahead of me was helpful for both of us putting in a gob of time on the folks behind. I weaved my way through the last few neighbourhood turns, with one family clapping as I passed, but otherwise little fanfare. I was glad to find the way back, as I hadn't paid attention on the way out, and finished in 5:09. I felt like I could have chopped quite a bit out by being smarter, having a mix of nonchalance about my gear and approach juxtaposed with a desire to go faster, but otherwise had a great time in terms of experience in my first -athlon race. Without any dreaded swimming. 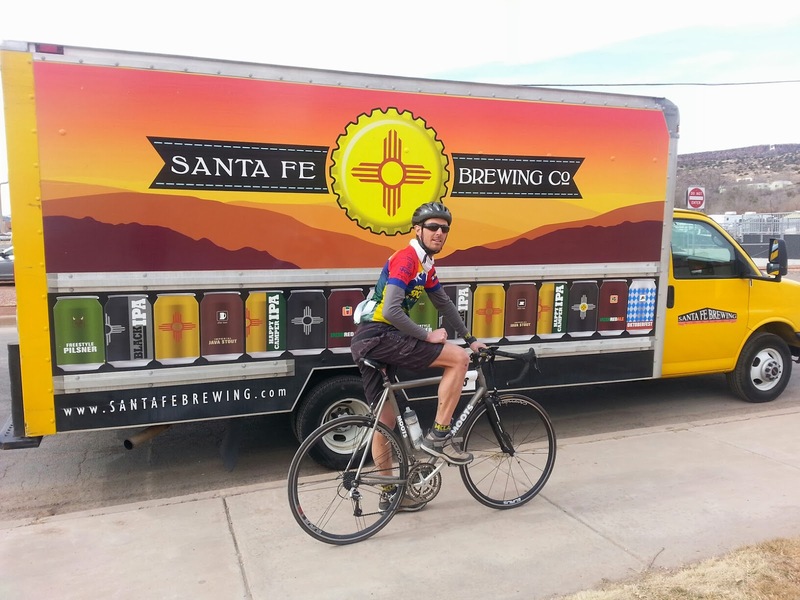 I met J and then enjoyed a sample or three of Santa Fe beers, enjoying a good chat with those guys as well as some folks who organize the race. I enjoyed hearing about the history of the race, and it was bittersweet to hear about how the race had almost twice as many participants in its heyday in the '90s. We shared similar observations that cross-country skiing has, unfortunately, dropped off in popularity in favour of (slower, easier, and more boring) snowshoeing. Perhaps a bump in the popularity and availability of AT and telemark gear will help. This is such a unique event that it's definitely worth checking out and supporting. I can't even think of many other places where such an event and a "natural" course up a mountain -- which has both reliable snow and relatively safe/low-angle avy conditions -- could exist. SLC? Mt. Bachelor above Bend, OR? Somewhere in Idaho or Montana? In Colorado, most candidates I can think of either have roads that are too busy/unsafe to be dedicated to a winter race (e.g., Loveland or Berthoud Pass), access, or snowpack issues. I enjoyed a new challenge that combined several of my interests, and it was really fun to line up in an event with completely unknown expectations, and a bit of "first-time" anxiety that many of us don't get when we do the same type of events repeatedly. At the same time, the -xathlon culture both exceeded and met my expectations, with a combination of friendly banter and socialization, as well as some serious-level gearhead competitiveness. I have no idea what place I finished in because it was listed in "Age Group" categories, and the Rambler staff here does not believe in Age Groups. Anyway, after musing on this a bit, we were pleased to see Alex cruise in on his finish, ending up in 3rd-place in the pairs division. He was able to celebrate with a beer in the sunshine, having left his bride-to-be Nora halfway up the mountain, where she had done the gloriously satisfying yet dangerous work of summiting (and descending) the top of the mountain for his team. Friends Chris and Steph made it safely down, together, having the additional challenge of riding mountain bikes, and taking turns lugging a new diamond ring up and down the mountain, respectively. Cheers to them! We missed their arrival as we headed to Santa Fe, where (in addition to several nice meals, as usual), J indulged me in letting me search a couple places, in vain, for Forrest Fenn's treasure. But that's another story. Remember, "Skins On, Wax Off!"